Skin Backpack Boy 1.2.0 can become an adornment of any world, or vice versa, be the main character who will rule in MCPE. Because it looks very presentable and also done in high quality. The boy wears a hooded jacket, a backpack and a pair of black pants. Whichever card you visit, which seat did not study, this skin will look equally effective everywhere. For servers, this image suits best. So do not hesitate to change your images, become more elegant with a new skin. The original combination of colors, a hood, fashionable trousers – this and more in a very short time will make the image in demand among the miners. Visually the skin is made in high quality, there is really nothing to complain about. 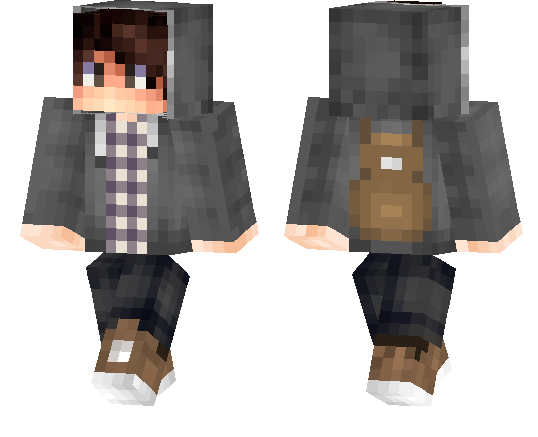 If you have been looking for something quiet for a long time, that would not cause the outburst or fear of the other characters, this Backpack Boy 1.2.0 skin perfectly suits these parameters. And then, it often happens that crafters want to be not supermen and not Betmen, but simply style dressed guys. With this you can even go on a date or build a house and then live in it. I wonder how such a skin will look if you play it on PVP battles? Many will be very interested in why this was done for the MCPE and who decided on such an adventure. Do you want experiments? Then try. It’s not the same thing if it appears in such arenas in the form of a creeper or Captain America, it’s like a bolt from clear skies. A simple, modest fellow, stylish and fashionably dressed and suddenly going to fight bosses or other players .. Hmmmm. But you can take a chance.